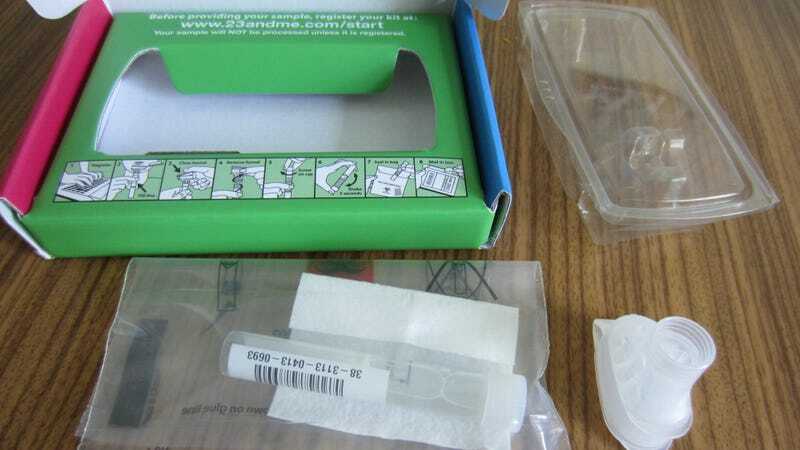 A 23andMe genetic testing kit. 23andMe customers might just play a role in helping create one of Big Pharma’s next blockbuster drugs. On Wednesday, the genetic testing company announced it was entering a partnership with pharmaceutical giant GlaxoSmithKline (GSK) to develop new drugs and therapies. As part of the collaboration, the company will allow GSK to peek at the (voluntarily shared) genetic data of millions of people who have taken 23andMe’s DNA home testing kits, NBC News reports. The new collaboration is likely the largest move by 23andMe yet to capitalize on its customers’ curiosity about their genetic makeup. According to NBC News, GSK will invest $300 million into 23andMe. The companies have also signed a four-year deal that will grant GSK exclusive rights to drugs developed with the help of 23andMe’s data. In a statement to Gizmodo, a 23andMe spokesperson described the fundraising deal as “separate from this [research] collaboration.” The first project based on this data will involve a gene known to make people vulnerable to Parkinson’s Disease, LRRK2. It’s true the company has long asked permission from customers to share their genetic data with outside sources for research purposes (it’s also used the data for its own research). And customers are allowed to opt out even if they originally said yes. But these partnerships have mostly been with publicly funded or nonprofit institutions such as the National Institutes of Health—a point that 23andMe goes out of its way to tout. Given 23andMe’s windfall, some ethics experts are advocating that customers should get a slice of the pie, too. Typically, 23andMe uses and shares its customers’ genetic data after it has been pooled together and stripped of any information that would allow anyone to trace back its origins to a single person. But more recently, the company has also asked customers for added permission to share their individual genetic and self-reported data with outside sources for research. Though this data is said to be stripped of information that would prevent identification, such as your name or date of birth, even 23andMe has warned it cannot “provide a 100 percent guarantee that your data will be safe” in the event of a breach. Experts have feared that data leaks from genetic testing companies such as 23andMe would allow insurance companies to screen out people with risky genes, regardless of genetic privacy laws. The company has so far sworn it will never intentionally share any of its customers’ “sensitive information”—including genetic data—with insurance or advertising companies, though it is already selling off other forms of data, such as survey results. Last year, 23andMe won approval from the Food and Drug Administration to explicitly market tests that promise to inform customers of their genetic risk for up to ten different diseases and conditions. In March, it won approval for another test that can tell people about their risk for breast cancer, based on the BRCA1 and BRCA2 gene. A 23andMe spokesperson reached out to Gizmodo via email after this article was published. According to the spokesperson, the $300 million equity investment made by GSK in 23andMe is separate from the four-year deal between the companies to develop new drugs. As part of the deal, 23andMe and GSK will equally split the costs of any initial collaborative efforts, with either company having the right to reduce its funding share or opt-out from any particular later project. Both companies will have “rights to profit shares or royalties from any new treatments and medicines produced” by the partnership, the spokesperson said. There are no plans to offer its customers who have opted into the sharing program any rebates from the collaboration, though they were informed about the news in an email and retain the ability to opt out from sharing their data. Correction 5:33pm ET: Our original headline stated 23andMe had raised money in order “to share” its users’ genetic data. The company, however, tells Gizmodo that the research partnership and fundraise deal were not contingent on one another. We have corrected the headline and clarified this in the text. We regret the error.